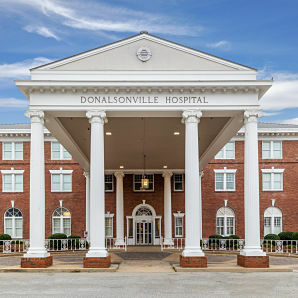 For more than 35 years Donalsonville Hospital has been helping the next generation of healthcare professionals gain the education they need to return to our hospital and make a difference in rural Seminole County, GA through our Healthcare Scholarship Program. We are proud to have given this opportunity to 100 healthcare providers within a range of specialties including primary care physicians, nursing, laboratory technicians, radiology technicians, medical records, and maintenance. We are honored to have recruited 11 hometown physicians who applied for our scholarship program, attained their medical degree and returned home to practice. In 2017, we welcomed back two local Donalsonville raised family medicine physicians and one OB/GYN who interned at our hospital during medical school. In 2018, a general surgeon returned home to practice. Since 1982, more than 3M in scholarship and loan repayment dollars have been utilized to bring much-needed healthcare professionals and critical staffing to this rural Georgia community. A Medical Technician (MT), is a skilled individual trained to carry out low to high complexity laboratory tests and operate laboratory equipment under the supervision of a certified medical laboratory technologist/CLS. MTs perform a test on blood and body fluid to detect parasites, bacteria, and other microorganisms that may be causing the patient's disease. They perform other diagnostic tests that aid physicians in the diagnosis and treatment of disease. Laboratory tests are carried out in toxicology, hematology, chemistry, microbiology, and immunology. Medical technicians work in various healthcare facilities including hospitals, offices of physicians, research laboratories, health clinics, veterinary laboratories, medical diagnostic laboratories, and biotechnology companies. Radiologic Science, also known as Radiography or Radiologic Technology, is a profession that requires a special balance of technical knowledge (working with equipment and ionizing radiation) supplemented with superior patient care skills (knowledge of human anatomy and physiology, excellent communication abilities, and having the desire for the safe delivery of diagnostic radiation). Technologists will encounter a variety of patients with different ages, sizes, and/or conditions that may make imaging a challenge. Radiographers perform a surprising amount of diverse exams daily from chest and abdominal x-rays to fluoroscopic exams, interventional studies, trauma, and surgical radiography.